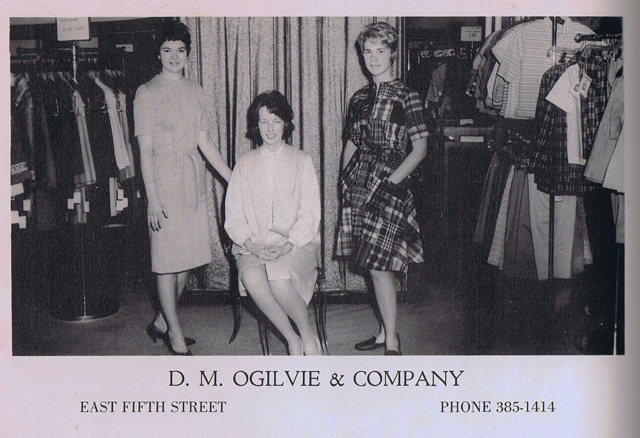 History of D. M. Ogilvie & Co.
D. M. Ogilvie & Co. is fortunate to have had a part in the history of the Tri-State community for many years. Operating on the Diamond, the predecessor of the company was the partnership of Porter and West, which later became Porter and Crosser. 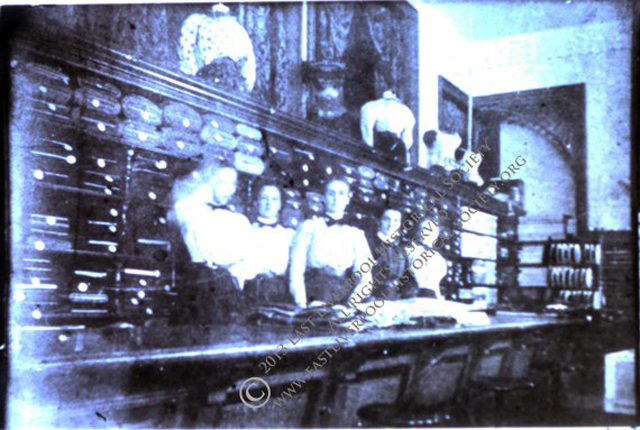 It was at this company, in 1890, that Dan Ogilvie, a farmer and teacher from Gavers, applied for work. 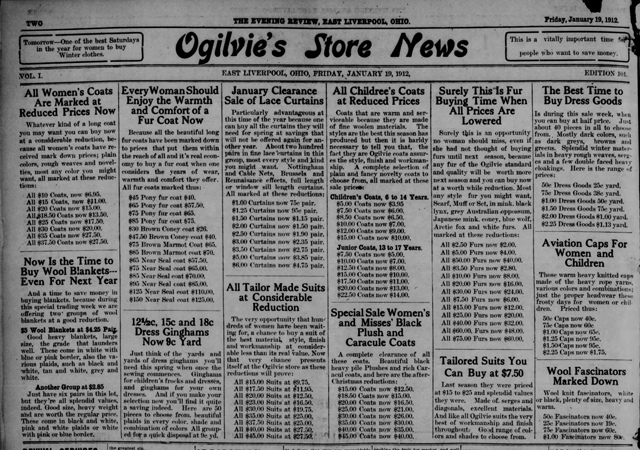 Some years later the company became known as the Crosser-Ogilvie Co. Then, in 1898, Mr. Crosser sold his interest in the firm and the new company became D. M. Ogilvie & Co. and it has maintained this name until the present time. 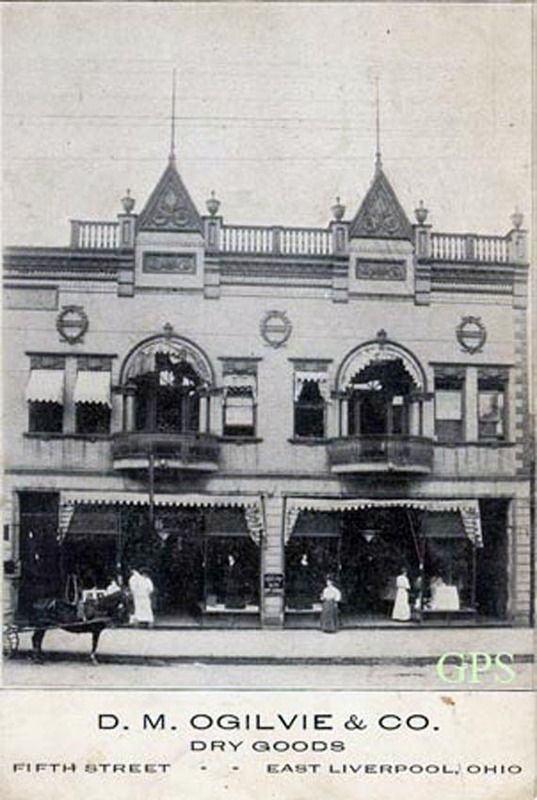 The Company moved from the Diamond to Woolworth's present location and then to the corner of Fifth and Washington Streets in 1912. 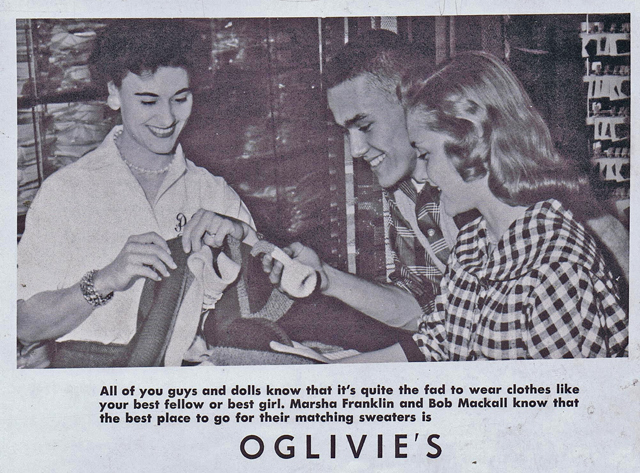 Ogilvie's, possibly either the Thompson Building or the Exchange Building. Some information probabby not widely known in this day and age.The Evening Review, Thu. 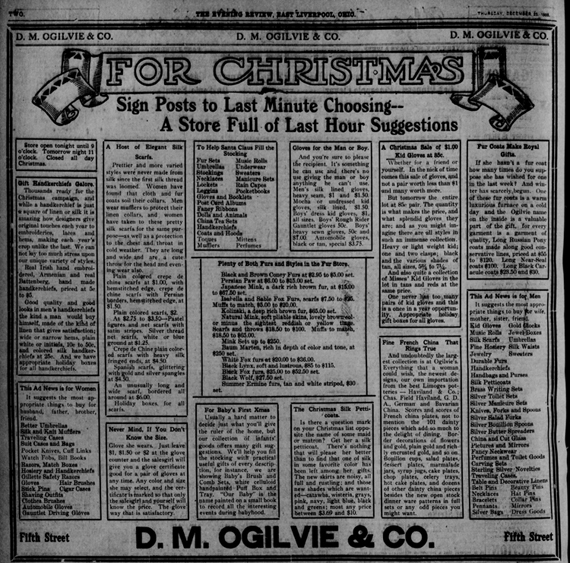 Dec. 22, 1904. 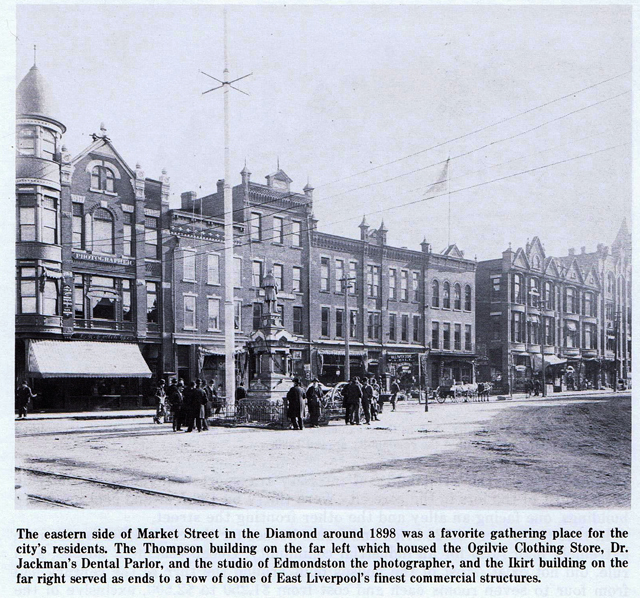 Perhaps it was this fire which forced the move from the Diamond to the Exchange Building in 1905. The Evening Review,Thu. 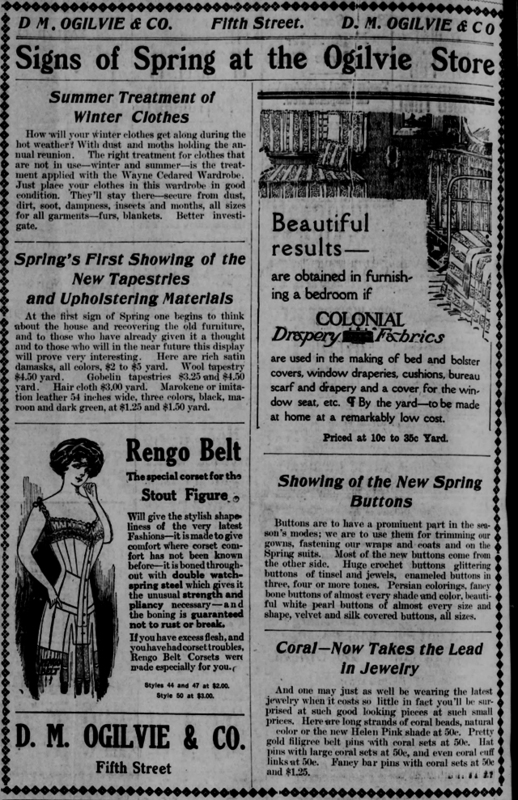 Dec. 23, 1909. 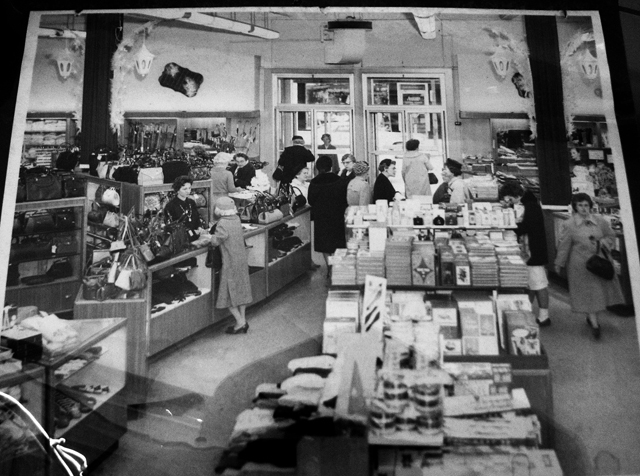 As in most cities, the general store has become the dry goods store, and then the department store. 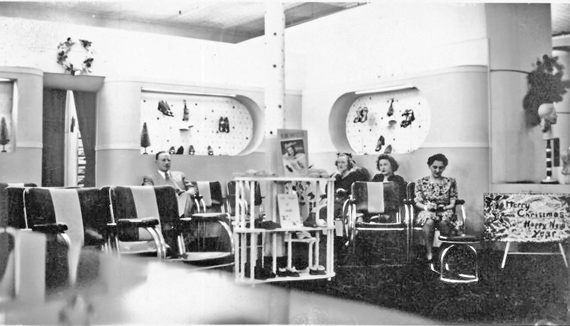 Now, through window display, advertising in newspapers, radio, and T.V., and the use of charge accounts, a sizeable volume is maintained. 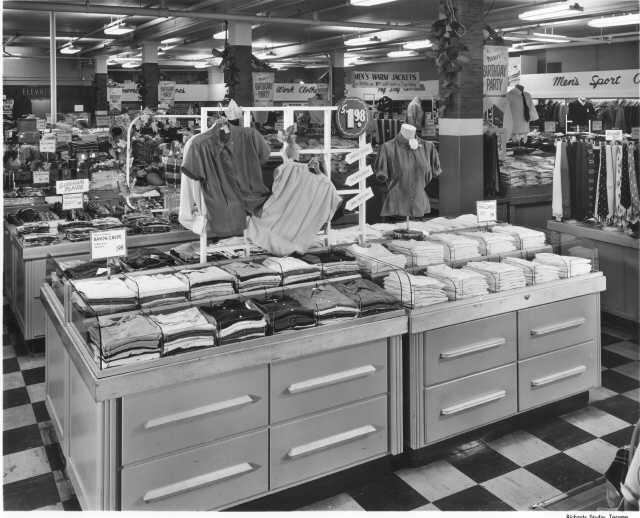 Records are kept on 700 classifications of merchandise including thousands of items purchased from many hundred famous as well as smaller sources. Fires and recessions have been survived and we look forward to a busy and exciting future in the Tri-State area. 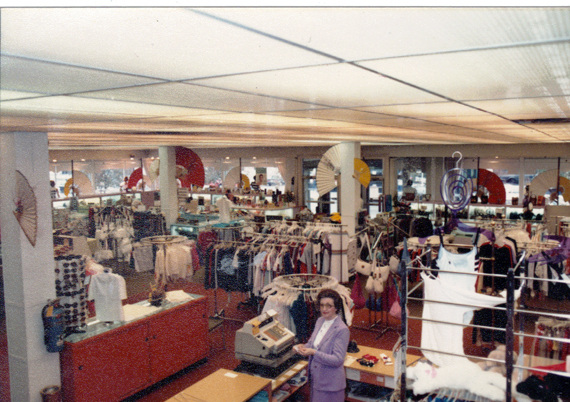 Toward that end, we have just completed a remodeling program in our store to better serve our customers for years to come. SOURCE: The Fifth Tri-State Pottery Festival, East Liverpool, Ohio June 15,16,17,1972. But we all know now that didn't last. 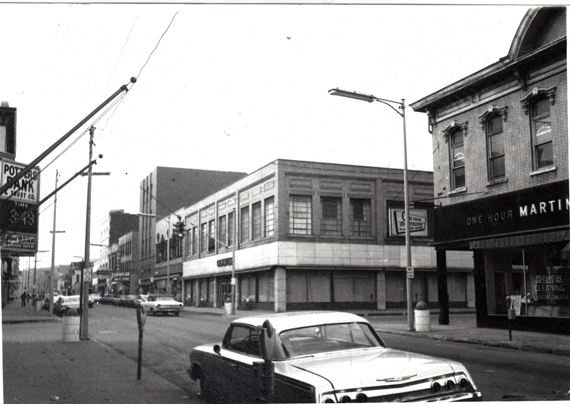 D. M. Ogilvie & Co, corner of East Fifth and Washington. 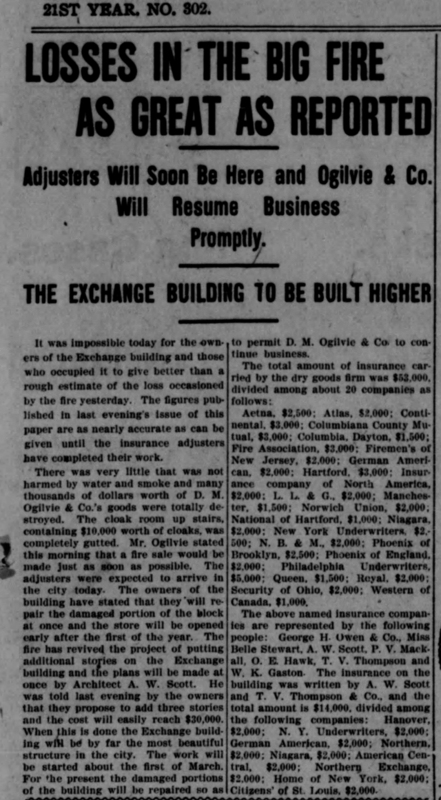 St. From 1905 to 1912 Ogilvie had been located in the Exchange Building (Woolworth's) next door to it's present location. 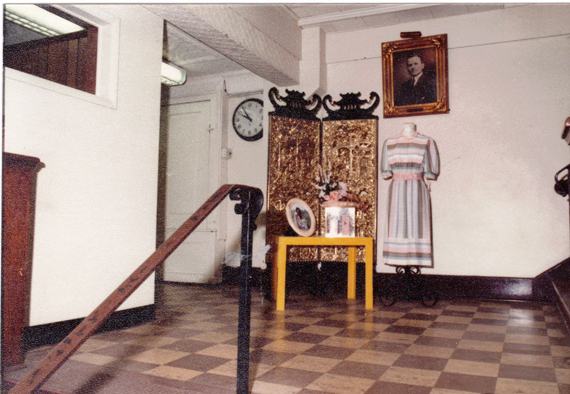 The landing between 1st and 2nd floors. Portrait of D. M. Ogilvie. 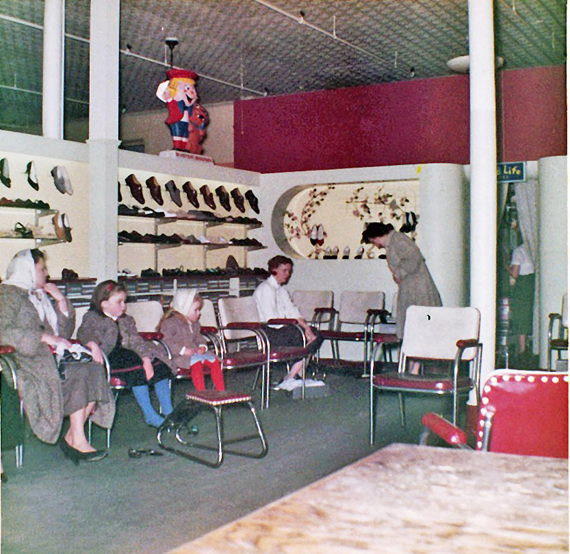 Here's another one from the Ogilvie's Department Store shoe department, I don't recognize anyone in this one, it's in color so I'd guess it's the mid to late 1950's, but I don't know for sure. Probably taken by my dad. Eddie and Gloria Hedrick. 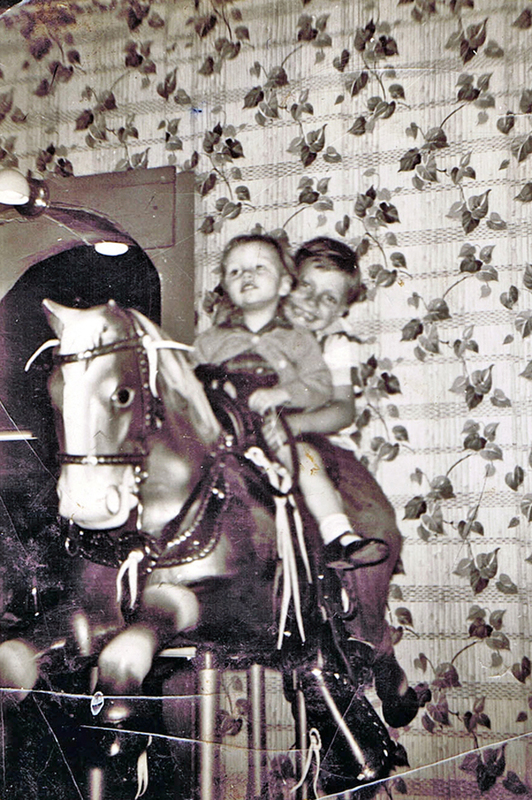 Riding "Sandy" in Manhattan Cafe on E 2nd Street. 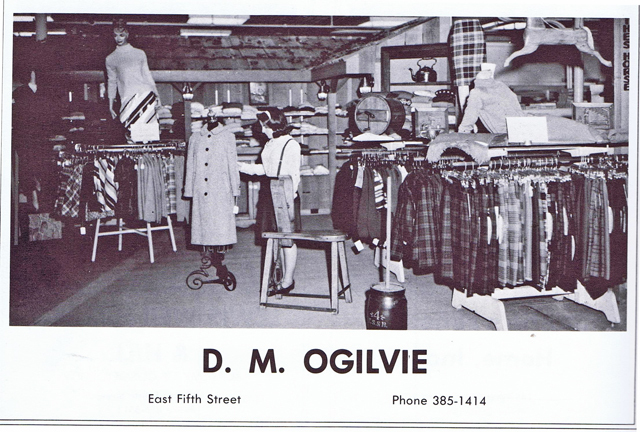 Horse was later sold to Ogilvie's department store. 1954-55. Picture and text courtesy of Eddie Hedrick. They say what goes up must come down. 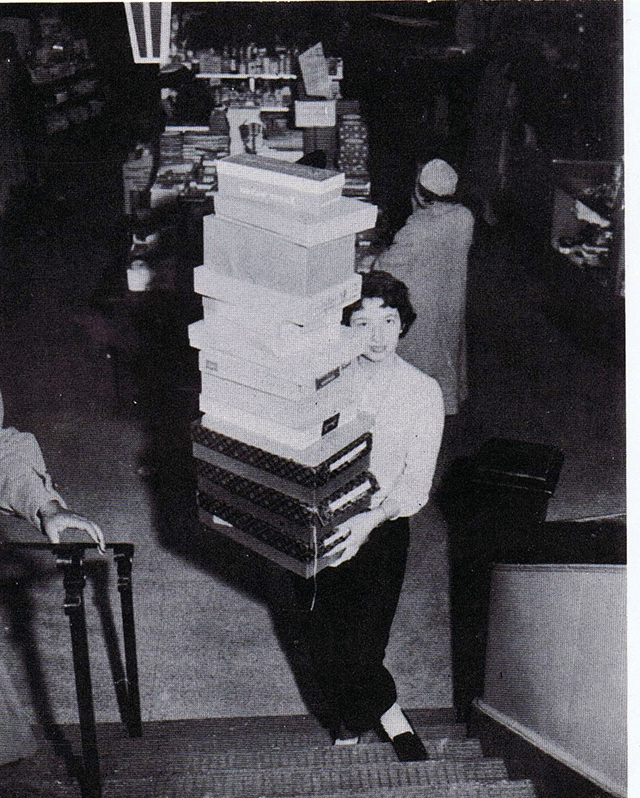 But if Nancy Cottrill buys everything she likes on the next floor at Ogilvies, it will take her days to bring it all down. Here is where you will find beautiful buys with quality to match. 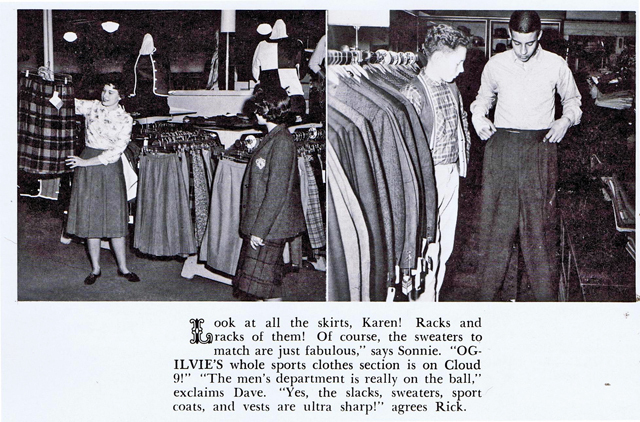 Buy at Ogilvies! You'll really love it! 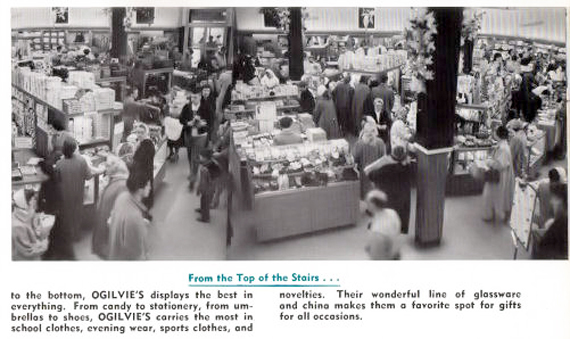 D. M. OGILVIE COMPANY "East Liverpool's Largest Department Store"